Clown struggles to balance seedy horror moments and B-Movie laughs, which makes for a tonally ambiguous watch that's too serious for comfort. Clown – Jon Watts’ long-silenced, Eli-Roth-produced possession flick – is despicably vile. Now, for a horror fan, this might come as a vote of confidence, and typically, you’d be right. I love a good horror movie that f#*ks me up in all the right ways, yet Jon Watts’ transformation-gone-goofy crosses a line that becomes less fun and overly morose. 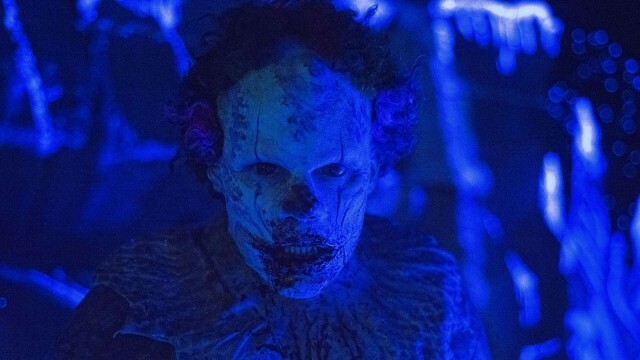 Everything suggests a wacky, wild metamorphosis – from a Peter Stormare bit-part to demon-infested clown suit – but this is grimy, gross-out horror with little meaning beyond kill, kill, and kill some more. It’s fun in spurts, but plays too serious for comfort most of the time – a Coulrophobic’s nightmare buried under weak, underdeveloped scripting. …which is because Kent is slowly turning into a demon who feeds on children. Shocker – it doesn’t end well. There’s some wicked effects work in Clown, which makes its foul stench all the harder to stomach. I mean, Eli Roth is involved – you’re getting gore, and furthermore, a devilish jester look for Kent’s final form. The character’s beginning appearance is that of a quilt-stitched onesie and a curly rainbow wig, but as time progresses, werewolf-inspired cutaways change Kent for the worst. Appendages elongate, his skin turns a pale white and the costume binds itself to skin – it’s practical effects work that delivers as needed. Couple said contorting with a few pretty gnarly kills – plus a BLOOOODY home-invasion finale – and gore-hounds should eat-up Watts’ carnage. On this single level, Clown does impress. Yet, the mayhem turns sadistic once Kent focuses his sights on innocent, tasty children. What should be campy, absolutely insane genre fun is painted with a very dark, sullen overtone – a seriousness that just doesn’t belong. In order to become human again, it’s believed that Kent must eat five children (one for every winter month) – a dramatic dilemma that plagues his wife. Does she feed him five kiddies, or kill her now-deformed husband? Let’s just say that Kent gets pretty damn close to salvation, and each kill only finds itself more repugnant than the last. Are we supposed to sympathize with a father who tears apart his son’s middle-school-aged class bully? Points for ambition are awarded, but they’re instantly negated by a nauseatingly bleak execution – one that doesn’t scare, entertain, or make any kind of statement. It’s Andy Powers’ job to make us believe in a magical, life-ruining clown costume, and there’s no doubt that Kent is continually in pain. He struggles with the suit – and a suicidal end – yet inevitably falls victim to the demon’s will with ample anguish. This would be fine, if Laura Allen’s performance as Meg didn’t overshadow Powers’ fully-changed form – a strong motherly performance that goes berserk once an unrecognizable “Evil Kent” lashes out against Jack. Peter Stormare is wasted, Powers is overshadowed, and Allen ends up stealing the spotlight – sounds about right, if it were opposite day. Stitches, IT, Killer Klowns From Outter Space – all clown-based horror movies that show a better command of their creepy sideshow killers. It’s a shame, because Clown has so much potential without knowing how to harness Dummo’s full powers (spelling is suspect, but Kent calls himself Dummo). As a thriller, Watts’ vision comes across with a bit too much grime, and as a B-Movie, there’s a lax stress on sinister laughs. A few scenes stand out – Kent’s neon-lit funhouse breakdown/our fist glimpse of Kent’s demon form – which allow Watts to wrangle a bit of style, but otherwise, a gloomy, sullen cloud dims what could have been a terrifying childhood nightmare. Some might indulge in such a vaguely mean-spirited watch, but – as you can tell – this won’t be a laughing matter for everyone.